London (VNA) – Vietnam’s tourism at the World Travel Market 2018 (WTM) in London from November 5-7 was able to capture attention from visitors to the event. Deputy Director General of the Vietnam National Administration of Tourism (VNAT) Nguyen Thi Thanh Huong said participants at a press briefing on Vietnam at the WTM were impressed by the growth rate of 20-30 percent of Vietnam tourism, as well as by new tourism products introduced by Vietnamese travel agencies at this year’s event. 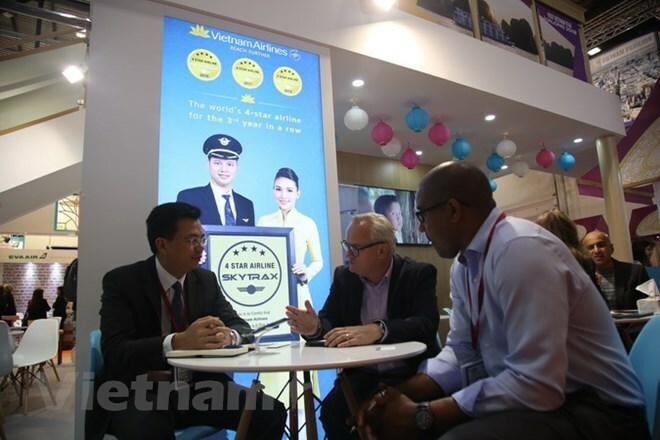 Vietnamese travel businesses attending the 2018 WTM said their stalls attracted large number of visitors, noting that they were excited about the results of their meetings with customers and partners during the three-day event. Huong attributed the success of the travel agencies to their efforts to constantly offer new services and products with high quality. She added that the visa exemption for travelers from 24 countries and the grant of e-visa also had positive impacts on tourism development. An important partner of Vietnam tourism is the national flag carrier Vietnam Airlines. A representative of the airline said at the press briefing that Vietnam Airlines is operating seven flights a week between Vietnam and London. The number of passengers on the route increased by 5 percent during January-September this year. Vietnam Airlines holds a 60 percent share in the total passenger volume between London and Vietnam. The WTM is one of the biggest tourism fairs in the world. It is held every November in London.